Unsettled weather is affecting most parts of New Zealand to put an end to the week, and an end to Winter. 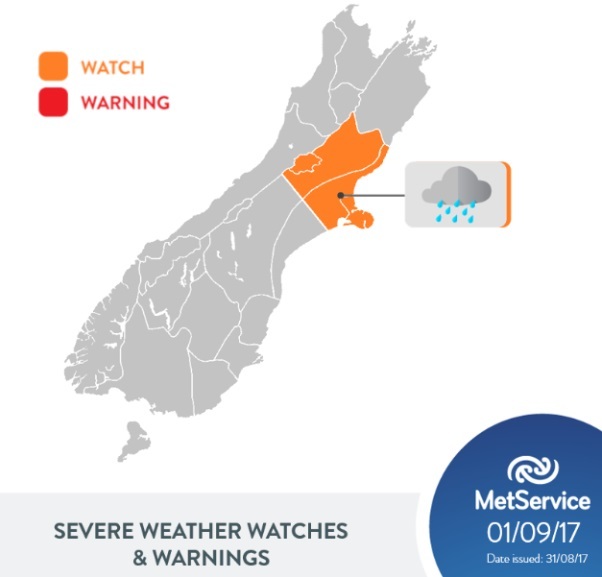 Low pressure systems sitting to the north and east of the country will bring wet weather to eastern parts of both islands, and also the upper North Island on Friday and into the weekend. Canterbury residents will be making good use of their gumboots, as they are expected to be the wettest part of the country as we head towards the weekend. For those who would like to see some sunny weather for the first weekend of Spring, the West Coast of the South Island would be their best bet. The low pressure systems begin to weaken and move away by the end of the weekend, and a front is expected to approach from the west later on Monday. This will bring a return to the northwesterly winds more typical of Spring, bringing wet weather to the west and drier weather to the east, and will set the scene for the week ahead.